21.12.2005 World Chess Cup: Round 7 - Tie-breaks. Closing Ceremony. Photo report. 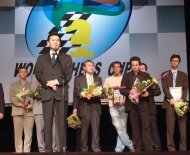 Please find the photos from the final day of the World Chess Cup: Round 7 tie-breaks and Closing ceremony. Some 10 years ago he used to be considered one of the most successful chess players of his gen-eration – Boris Gelfand has been a regular winner of interzonals, and played in the World Cham-pionship candidates matches. 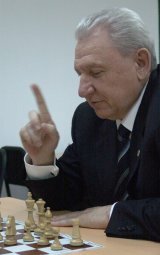 Now, in Khanty-Mansiysk, he has been one of very few players of older generation (couldn’t find a better term), who made an effort to stop the attack of 20-year old Grandmasters, occupying top places of the World Chess Cup pedestal.